September 28 – October 4 – Craig and L'Or L.
We love working with our Institute Council – they are the best! After hours of planning, they discovered some conflicts during our meeting on Monday with all but one of the activities/FHE planned for October. No one complained, they just started making calls to cancel arrangements. A newly announced Tri-stake Dance, Fireside, stake conference and re-broadcasts of the General Women’s sessions and General Conference will be keeping everyone busy anyway! Joey (always helping out), standing in the doorway, James (sitting), is our music/movie specialist, and the council: Sean, Tetika, David (pres) Lini, Jeanette, and Divani. 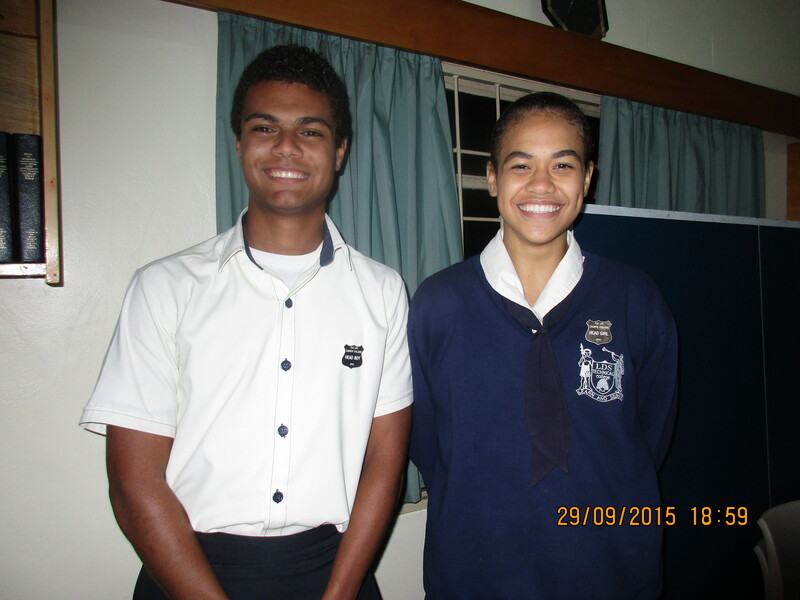 Two of our YSAs, Opeti and Savaira, are the Head Boy and the Head Girl at the LDS College – equivalent to being high school student body presidents. 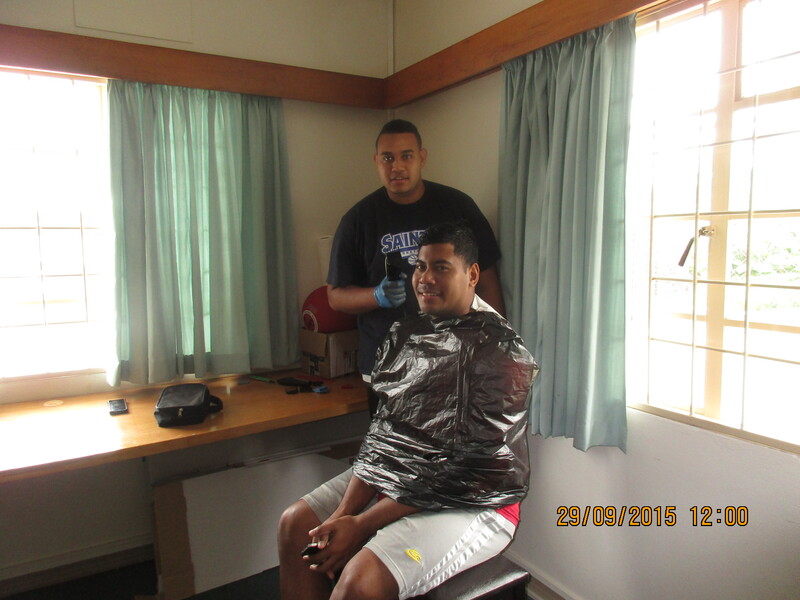 Opeti and Savaira come straight from school to attend institute. Lots of YSAs do, and we love to see their different school uniforms. 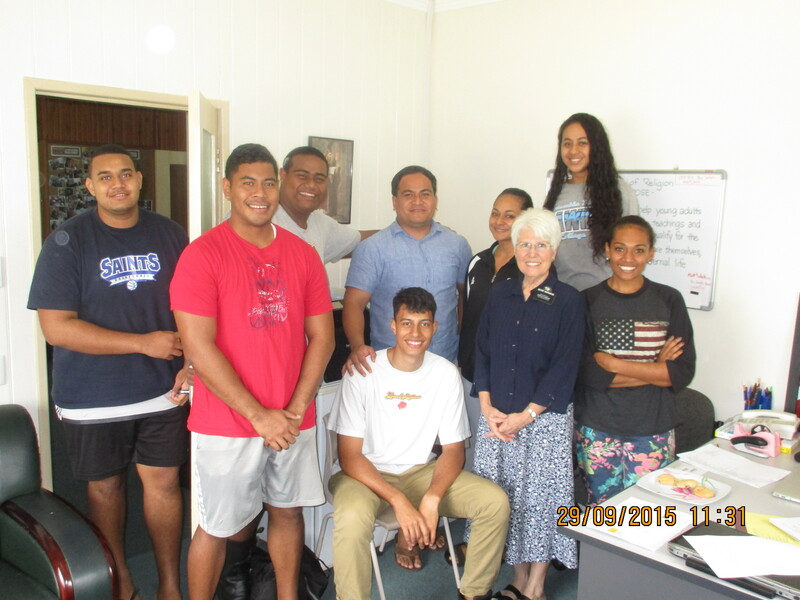 Frances, our returned missionary who survived the cyclone on Taveuni, invited us to attend her 21st birthday party. We’d been gone all preparation day, so thought we would just stop by to give her a card — and found out we were to be honored guests at her head table! 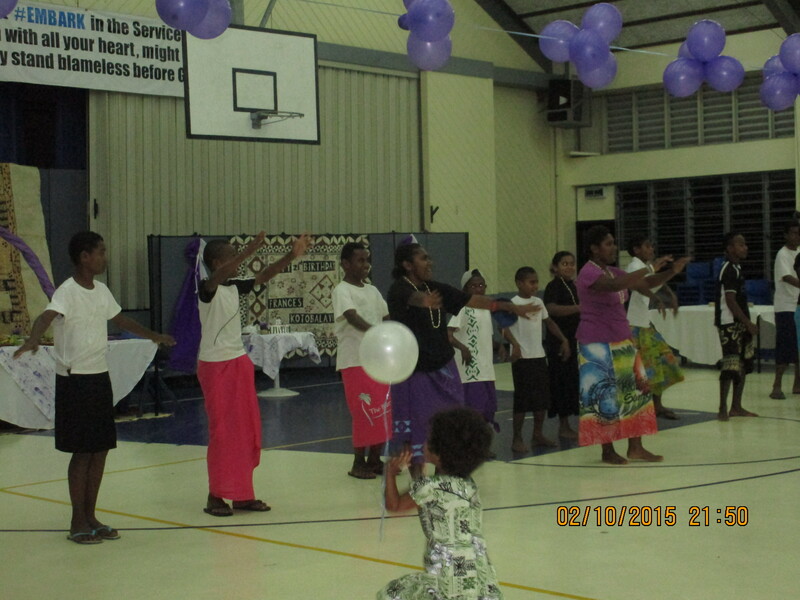 A 21st birthday here is quite the celebration, and includes a key ceremony where they are given the key to their future. Frances’ great-grandfather, a Methodist minister, gave his first ever speech in English, then presented Francis a key that had her picture from the Institute missionary board beautifully displayed on it. 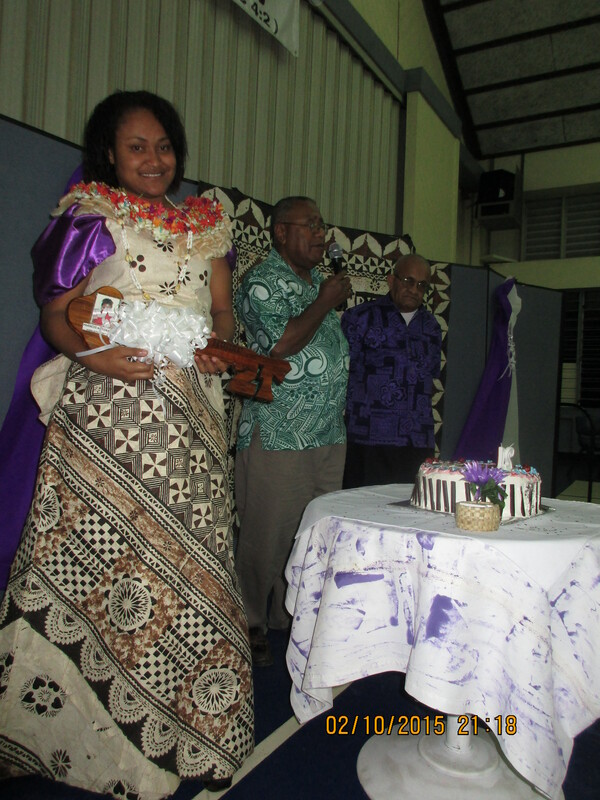 Her mother made the beautiful masi (tapa cloth) dress she wore for the program, and a dress to dance in later. The large masi behind the head table is so precious it is used only on special occasions. And what a Fijian feast!! While we waited for the evening to begin (only 2 1/2 hours) we had fun visiting with the MC. 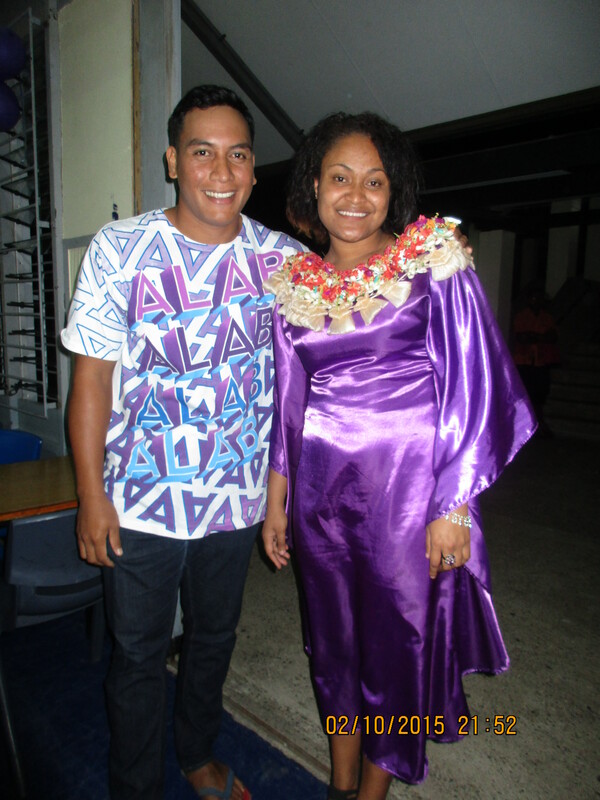 He said this about ‘Fiji time’: “Get used to it, get through it, and get over it!” We felt so honored to be there, and enjoyed the conversations we had with everyone so much, it was well worth the wait. We’re over it! 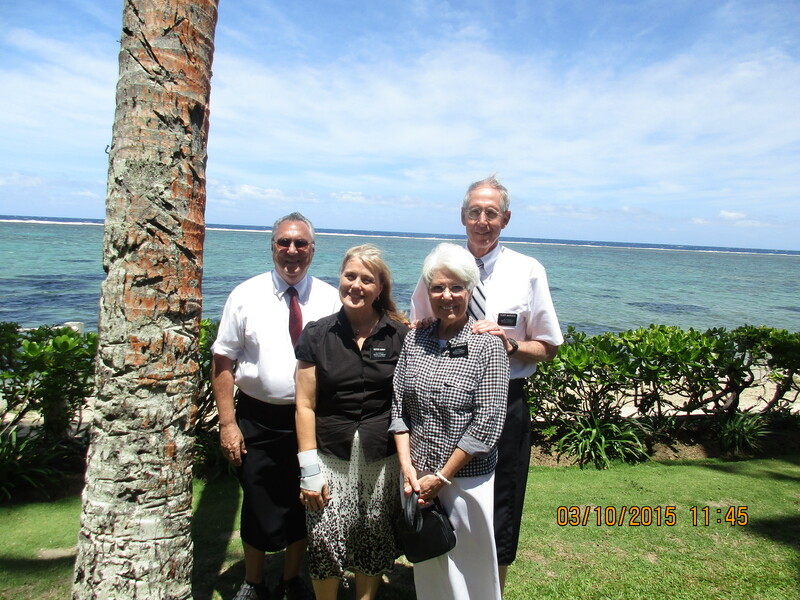 Saturday we rode up the west coast with Elder and Sister Knight and had a delicious lunch at the Outrigger resort. Which, by the way, is a favorite of Aussies and New Zealanders – so the place was packed with tourists! But it was a gorgeous day, a wonderful scenic drive, and it was fun to have the time together in the car to visit. Knights and Whiteheads enjoying the sun at the Outrigger.